Manometer is also called a liquid column manometer and is used for low differential pressure measurement. The usual range of pressure that falls for this device is around 0.2 MPa or 2 Kg/cm2. This device is used for most cases as it is very simple in construction and highly accurate of all the types. There are basically two types of manometers. There are also variations of the above said basic types called Enlarged-Leg Type Manometer, and Inclined Tube Manometer. Another manometer used commercially is the Ring-Balance Type Manometer. 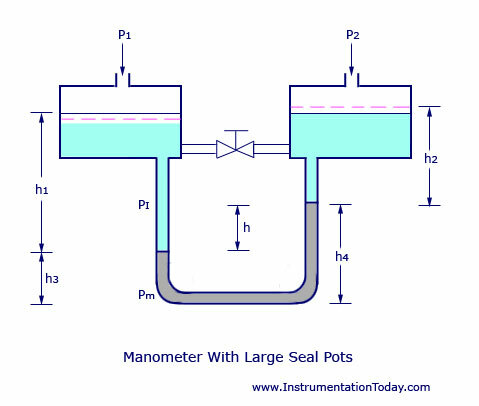 An enhanced version of a manometer is shown below with a seal liquid over the manometer liquid to separate the process fluid from the manometer fluid for any probable source of trouble like absorption, mixing or explosion and so on. Seal pots with large diameters are also placed for increasing the range. The equation for differential pressure is the same as mentioned above. The figure of a well-type manometer is shown below. The figure of an enlarged-leg manometer is shown below. The factor cosb expands the scale of the instrument. When b is quite large, h can be increased such that (h.cosb) remains constant. The figure of an inclined tube manometer is shown below. The micromanometer is another variation of liquid column manometers that is based on the principle of inclined tube manometer and is used for the measurement of extremely small differences of pressure. The meniscus of the inclined tube is at a reference level as shown in the figure below, viewing through a magnifier provided with cross hair line. This is done for the condition, p1=p2. The adjustment is done by moving the well up and down a micrometer. For the condition p1 not equal to p2, the shift in the meniscus position is restored to zero by raising or lowering the well as before and the difference between these two readings gives the pressure difference in terms of height. The weight distributed over the entire fluid. The drag force due to its motion and the corresponding tube wall shearing stress. The force due to differential pressure. Surface tension force at the two ends. This device cannot be actually called a manometer, but it is often considered so. The tube is made of polythene or other light and transparent material. This tube is bent into in to the form of a ring and is supported at the centre by a suitable pivot. The tubular chamber is divided in to two parts by spilling, sealing, and filling with a suitable light liquid like kerosene or paraffin oil for isolating the two pressures. Pressure taps are made with two flexible tubings. Pressures p1 and p2 act against the sealed walls as shown in the figure below, and rotate the ring which is balanced by the counter weight w.
Of the various manometric fluids used, mercury has many advantages like low vapour pressure, non-sticky nature, and wide temperature range from -20 degree Celsius to 350 degree Celsius. Its high density is disadvantageous for low differential pressure measurements. The device installation and maintenance is known to be quite expensive. sir it was really very help ful thanks for all this. i m doing B tec Honr in Chemical technology from comwave university islamabad…. i m facing some problems in fluid mechanic and applied thermodynamic .. Thank you sir, this is good help to me. Dz is very helpful, thanks a lot! thanks sir its really good………. It really helpful for me about inclined manometer.. Thanks a lot sir. Really needed this info!